Residency programmes and scholarships for comics artists afford opportunities for creative work and foster encounters. An overview of initiatives in which German-speaking countries take part. Max Baitinger was fond of the diffuse light in Finland: “It isn’t very different from my usual lighting conditions in Leipzig, and yet it surprised me – I had the feeling that it was always afternoon”, says the comic illustrator. Baitinger spent a whole month in an artist residency on the Finnish island of Suomenlinna. His stay was financed by the programme Cune – Comics-in-Residence Artists. The scholarship programme of the Finnish Comics Centre in Helsinki is aimed at the European area. In addition to Finland, participants include Germany, Lithuania, Latvia, Norway, Denmark, Poland, the Netherlands and Russia. Baitinger was allowed to live for a month on the island. There was enough time for him to push ahead with his book project Röhner. The seclusion of the place had the side-effect of changing the way he worked: “I began there to blog my work”, he says. The list of illustrators who have travelled abroad with the Cune programme reads almost like a Who’s Who of the contemporary comics scene: in addition to Baitinger, Marijpol from Germany was in Helsinki, as were the French illustrators Julie Delporte and Aurélie Grand, while Berliac from Buenos Aires worked in Riga and the Finnish artist Jaana Suorsa in Malmö. In the international comics scene the Goethe-Institut plays an important role: many institutes abroad implement scholarship and exchange programmes, the Munich headquarters organizes travelling exhibitions and supports the scene with its own comics portal on the internet. Joachim Bernauer of the Cultural Department of the Goethe-Institut explains the advantages of the medium: “Comics and graphic novels are simpler to read than a thousand-page novel”. Many people abroad lack the necessary language skills to read German literature in the original. “Comics help break down reservations.” Comics, he says, can reach a wider audience. 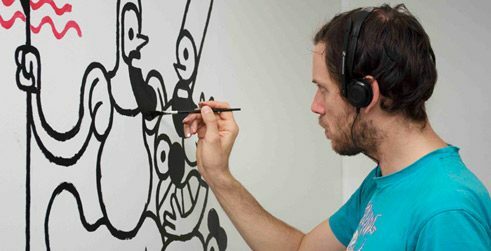 In 2012, for example, the Goethe-Institut in Porto Alegre, Brazil, issued invitations to the exchange programme Osmose: three Brazilian comics artists travelled to Germany and three German counterparts explored Brazil. The illustrators reported their experiences in blogs: João Montanaro sketched a pretty cyclist in Munich, Paula Mastroberti in Berlin drew a businessman with green hair and Birgit Weyhe in São Paolo painted colourful watercolours of the local markets. In the Goethe-Institut Lyon’s project Comic-Transfer, comics artists from Belgium, France, Italy, Lebanon, Morocco, Portugal, Spain and Germany came together. At the end their works were presented in a travelling exhibition and published in a catalogue. A project in Finland was unusual: in 2014 the German illustrators Anna Haifisch and Birgit Weyhe worked for two months with residents of two retirement homes in Helsinki and shared their experiences in a blog. The project Europe in Speech Bubbles had a political background: it was organized to mark the 50th anniversary of the signing of the Élysée Treaty between Germany and France. Manuele Fior, Emmanuel Guibert and Anke Feuchtenberge drew reports in comics about strikes and austerity measures, protests and political commitment. In Asia too the Goethe-Institut promotes comics art. The portal Comicconnexions presents comics, cartoons, mangas and graphic novels from Germany, the Philippines, Vietnam, Singapore and Indonesia. Once a year the German-Swiss cities of Bern, Lucerne St. Gallen, Winterthur and Zurich invite applications for a joint comics scholarship for the promotion of traditional and experimental forms. In 2015 the main grant of 30,000 Swiss francs went to Matthias Gnehm. The renowned Zurich comics artist used the funds from the scholarship to work on his complex book project Salzhunger. Work on such ambitious adult comics usually lasts several years. Thanks to the grant, Gnehm could press ahead with his project. A project of the Swiss Arts Council Pro Helvetia was less about promoting individual works as about an exchange amongst illustrators. It invited 19 comics artists to explore the cities of Zurich and New Delhi and to record their experiences. “Through this exchange of comics authors we wanted to stimulate a natural conversation between two distant cities”, says Anindya Roy, explaining the project. The comics were then published jointly by the Indian publisher Phantomville and the Zurich Edition Moderne in the comics anthology When Kulbhushan met Stöckli. Besides the major foundations and programmes there are also small initiatives in German-speaking countries that offer grant programmes for comics illustrators. Christine Kriegerowski has been invited six times to the artists’ colony Schöppingen. The Berlin illustrator found her time in the small village in North Rhine-Westphalia “incredibly effective”. Together with the authors Gili Ben-Zvi and Karl Heinz Jeron she developed the book Atomreligion-Edutainment-Comic-Katechismus (i.e. Nuclear Religion-Edutainment-Comics-Catechism), which points to the dangers of nuclear waste. Comics artists are also supported by the Akademie Schloss Solitude in Stuttgart. On his stay there, the Indonesian artist Popok Tri Wahyudi devoted himself to interdisciplinary work with other artists. His graphic novel The Light House appeared in 2009, published by Edition Solitude. The Indian artist Sarnath Banerjee also came to Stuttgart; his graphic novel questions the social conditions in India and reports on bribery and corruption, nationalism and bureaucracy. In Austria the Atelierhaus Salzamt regularly invites comics illustrators to Linz. In the studio flats on the Danube, there are rooms and facilities for five artists to live and work. The works that are created during the three to six-month stays are presented at the Nextcomic Festival. Scholarship holders have included the Italian cartoonist and illustrator Bianca Bagnarelli and the German comics artists Theresa Lettner, Ludmilla Bartscht and Nils Oskamp. Rieke C. Harmsen is an art historian, curator and editor of the Evangelischer Pressedienst (epd) news agency in Munich. Copyright: Text: Goethe-Institut, Rieke C. Harmsen. This work is licensed under a Creative Commons Germany Attribution – NoDerivs 3.0 Germany license.